You can now respond to incoming text messages from the lock screen or from within other apps. You no longer need to go to the Messages app. In addition, Apple has added SnapChat-like audio and video messaging, with the messages self-destructing in a couple minutes (unless you change the settings). You can take photos or record audio or video right within the app. You can also access your Photo Library to send multiple photos or videos, again from within the app. The new Messages app also adds useful group messaging features, including naming a conversation and adding or removing people during a conversation. You’re also now able to leave a conversation. In addition, a Details link shows the contact information of the person you're messaging and lets you share your location with other iOS users. If others have shared their location with you, you can see their location on a map right within the thread. The Details screen also lets you name conversations, and a Do Not Disturb button lets you stop your phone from making sounds or vibrating when messages come in. Yet another feature is the ability to see a list of message attachments, such as images and videos. To save space you can delete them without having to delete the entire conversation. You can also save space by setting Messages to automatically delete conversations after 30 days or a year. A major change announced at WWDC in June was iCloud Photo Library, but it's apparently been delayed. In iOS 8 Photos includes new search features. When you do a search, the search field prompts you by showing a collection of photos taken nearby, a collection from a year ago, and your favorites. You can also search by date, time, location, and album name. Plus, in the Albums view you can sort your photos in a variety of ways, such as according to the app used to edit them and according to the type of file (photo, video, panorama, time-lapse video, etc.). The Photos app now has more powerful editing capabilities. You can crop photos and Photos will even automatically straighten the horizon for you. The app makes it very easy to adjust lighting and color just by moving a slider. You can fine tune facets such as brightness, contrast, exposure, highlights, shadows, and vibrancy. And you can rotate photos and control aspect ratio. The app includes built-in filters and the opportunity for third-party developers to create additional filters. You can now shoot time-lapse videos and specify the interval when a photo will be taken. A new hands-free feature lets you get Siri’s attention by saying, "Hey Siri." Plus, integration with Shazam means that if you like some music that you're hearing, you can simply ask Siri what it is. And you can ask Siri to purchase it. With iOS 8, Touch ID is now available to third-party apps if the developers choose to add this feature. Third-party keyboards such as Swype are now available in iOS 8. The iOS 8 keyboard is a lot smarter, predicting words as you type. You simply tap a word from suggested words and phrases that appear in a bar at the top of the keyboard top based on your past conversations and writing style. You can now make greater use of gestures: swipe right to mark as unread, and swipe left to flag a message, move it to a folder, or move it to the Trash. If you're writing an email and want to look up something in another email in your inbox, you can simply swipe down on the draft email and it disappears. When you want to continue writing, you swipe up from the bottom to make it reappear. Mail also now recognizes email content such as a reservation, flight confirmation, or phone number. A notification appears, and you simply tap it to add an event to your calendar or a phone number to your contacts. The iOS search utility has greatly expanded function in iOS 8. When you start entering a search, iOS 8 makes suggestions right in the search screen. It uses context, such as news reports or location, to offer up answers. If you appear to be typing in the name of a movie, for example, it knows what current movies are playing and will give show times at nearby theaters. If you start typing the name of a restaurant, Spotlight will show you one nearby. Other information it automatically offers up includes Wikipedia entries, news reports, and web sites, as well as information from the iTunes Store, App Store, and iBooks Store. The above Spotlight features are all also offered in Safari’s smart search bar. In addition, Safari in iOS 8 has an option when you’re making a purchase on the web to simply use your device’s camera to input your credit card information. There is also now the option of private browsing tabs. For iPad users, will include a new tab view similar to that on the iPhone and a new sidebar that slides out to show your bookmarks, reading list, and shared links. iOS 8 brings customization features to Notification Center, including the ability to add third-party widgets to the Today view such as weather, sports scores, and current eBay auctions. In addition, as noted above iOS 8 lets you respond to notifications from the lock screen or from within other apps. You can also accept or decline calendar invitations, mark an email as read or delete it, and mark a reminder as complete. Plus, third-party developers will now also be able to include these sorts of interactive notifications in their apps. 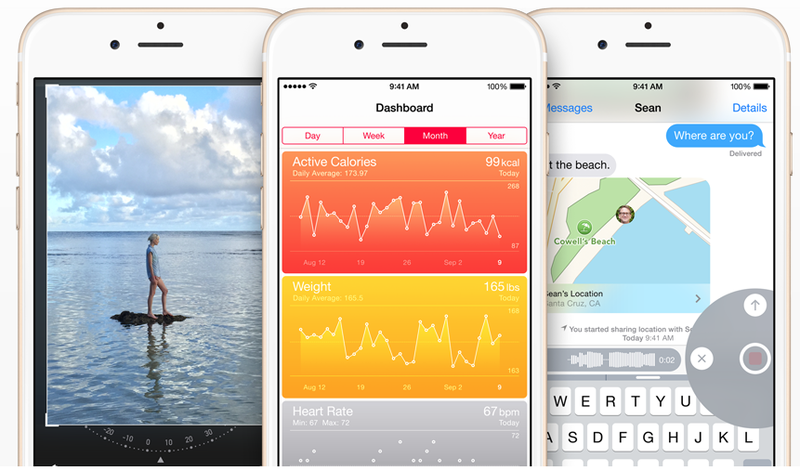 This new app is a repository for all of your health data. A Dashboard lets you view your health and fitness data at a glance, using a card-based presentation to show you information related to fitness, nutrition, lab results, medications, sleep, and vitals. Some of that info you enter, some comes from third-party apps and devices. The Medical ID feature holds all the information that would be needed in an emergency. You can create an emergency card that’s available on your lock screen. You can now use iCloud to store a wide variety of files, including pdfs, presentations, spreadsheets, and images. In the past iCloud would only store documents created using Apple's programs such as Pages. In addition, Apple has reduced the price of iCloud storage, starting at $0.99 per month for 20 GB. Higher tiers include $3.99 per month for 200 GB, $9.99 for 500 GB, and $19.99 for 1 terabyte. Any edits you make to a document appear on all your devices. Plus, you can now work on a single file across multiple apps. Sign up here to get the latest iOS 8 tips and tricks delivered right to your inbox.